(36) Now one of the Pharisees invited Jesus to have dinner with him, so he went to the Pharisee’s house and reclined at the table. (37) When a woman who had lived a sinful life in that town learned that Jesus was eating at the Pharisee’s house, she brought an alabaster jar of perfume, (38) and as she stood behind him at his feet weeping, she began to wet his feet with her tears. Then she wiped them with her hair, kissed them and poured perfume on them. (40) Jesus answered him, “Simon, I have something to tell you.” “Tell me, teacher,” he said. (43) Simon replied, “I suppose the one who had the bigger debt canceled.” “You have judged correctly,” Jesus said. Love it!!. The picture reminds me that I want to go to Tulip Festival in May and I had better book a hotel room before every thing is gone. I may already be too late. Ugh. I would like to experience the beauty once while I still can. The scripture reading is so visual. It is a vibrant picture of what I owe our Lord for His sacrifice for Me and all who will come to Him. The woman knew just how precious He was to her. Rich Mullins–The pictures that went with this song–amazing. What beauty was spoke in the words and the pictures. God created such a beautiful world. It is a blessing to know there is still some of it that has not been defiled by man. The beauty in a single flower or the pheasants wings. Every single portion of it brought to us by a wonderful Creator. My cup runs over. My love and prayers go out to all this morning!! Amen to Brenda’s comments … you’ve shared my heart as well. The Lord is so utterly beautiful as He loves the oppressed. Such love is humbling to receive but oh, it feels so wonderful. Thank you and praise to Christ alone! Amos – Thank you for the video. Myriam has a beautiful heart. Wishing everyone a wonderful Sunday and coming week! Kathi- I love tulips, unfortunately so do the squirrels in my yard, they raid my flowerbeds. That photo is amazing, did your husband take that? What is that pink machine? I want to say tractor, but not much of a farm gal, any who I love that it is pink. Hope you have a wonderful week too. Gail – Yes, my husband took this photo last spring. This is at a tulip farm about an hour from our house. On really clear days you can get Mt. Hood in the background. And that is one very pink John Deere tractor sitting back there. Where I grew up, that would have been blasphemy! Thank you, Amos. Miriam has raised the bar so far up, I don’t believe I could ever reach it. Tears—is right. We are to be thankful in all things, and this precious child truly is. 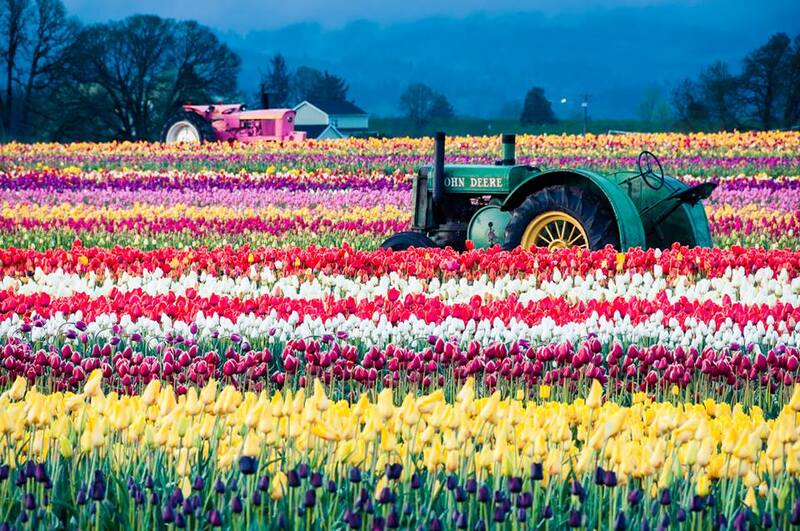 Kathi, do you know we lived in Beaverton for 10 years and not even once visited that tulip farm. I had plans to do so pretty much every year, too. Julie Anne – It now costs $5/person ($20 max.) to get in. We used to get in for free on the weekdays and did field trips there. I guess if people are willing to pay, more power to them. Brian’s not planning on going back this year. He said it’s overrun with photographers. I noticed that they have a $20 photographer fee now. Wow, I had no clue. Yea, I remember when it was free during the week. Prayer request – ok, friends, I have one big project/presentation tomorrow and one final on Tuesday, The most difficult/challenging term of my L.I.F.E. is coming to a close. Yahoo! Praying for you Julie Anne. Quite a significant event and achievement. JA, I guess your presentation is going on about now. What was it about? I am sure you rocked it! Let us know. This is for my statistics class. I’m doing the “truth” side showing that you need to look a little closer at the data and not be fooled by people who try to mislead you with their bogus numbers in statistics. Here’s a little bit of it (the professor uses the word “crap” a lot, so I threw it in there a good bit – lol. I guess I’m always trying to expose the truth wherever I go. It’s Dr. Seuss rhyme style and I’m wearing a Dr. Seuss-type hat and have a cool red/white striped pointer with a white glove on the end. There will be a power point show playing while we are talking. and discount this crap as ridiculous spoof. They took advantage of YOU and thought you naive. And look at their numbers without dire worldly concern. It’s not flowing exactly the way I want yet, but I still have a couple hours to rehearse with my group. We’ll get it. Love it J.A. I see a 4.0 on your presentation. You rock. And for anyone who needs to write up something in rhyme, I highly recommend this site. It rocked. rhymezone.com. Yay! One down, one to go.